KOHAR Symphony Orchestra and Choir, internationally acclaimed for its performances in cities around the world, performed in Lebanon after an eight-year interval. The tickets were sold out long before the concert dates, attracting fans and audiences from almost every corner of the world and whose hearts and minds were set to be fascinated by the performances of KOHAR at the Roman Amphitheater of Zouk Mikael, Lebanon. Not only the scenic beauty of the Amphitheater but also the scent of the sea breeze from the Mediterranean set the stage for the majestic view of the castle that was built on the stage to remind the audiences of the glorious Kingdom of Cilicia that was once home to most of the Armenians who settled in the Middle East after they were deported from their homelands almost a century ago. The star of the performances was Maestro Sebouh Apkarian of Cyprus, who conducted the Symphony Orchestra and the Choir with his own flair and ingenuity. The first part of the program included classical, romantic, pop and folk songs and instrumental pieces, specially arranged for KOHAR with an emphasis on the traditional Armenian instruments such as Doudoug, Kanon & Dehol. These were fused artistically to convey to the audience the nostalgia of the rich Armenian heritage and culture. After a short intermission, the second part of the program began with jazz-fusion that enthused young and old audiences with the unique performance that used different instruments including the Armenian Zourna. The audience erupted with a thunderous applause, which prompted the orchestra to continue setting anew vibe into the amphitheater. After that invigorating ambiance, the program shifted to patriotic songs. While the somber tunes recalled the sorrow and pain that the Armenians suffered, KOHAR moved the audiences to an upbeat and lively tempo that sounded like the marching conquest of Armenian heroic past. Another focal aspect of the concerts was the masterful choreography of the dancers, who performed graciously to the true Armenian tunes with their soothing posture and charming smile. The song “Verganknir Guiliguia” (Restore Cilicia) that was composed exclusively for KOHAR turned out to be one of the most favorite piece in the program that thrilled the audiences even more as they waved the flags of the Kingdom of Cilicia provided by KOHAR with pride and dignity. The participation of the audience with KOHAR was a memorable aspect of the performances as the stage and the audience merged as one in yearning to witness the restoration of Guiliguia to its past glory. 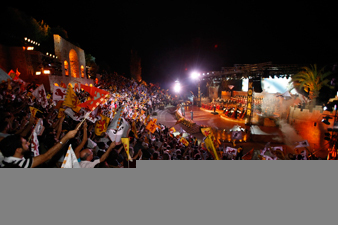 As the program continued to its finale with lively mood, the audiences forced the Orchestra to perform additional 6 encores and hence bring a colorful array of bright explosive fireworks that bolstered the midnight sky to mark the grand finale of the KOHAR concerts in the majestic Roman Amphitheater in Zouk Mikaël. The final performance, in its entire splendor, was yet another masterfully enriched fusion of flawless orchestrated songs, dances and pantomime acts. The echoes of the thunderous ongoing applause filled the air with notes of powerful dignified emotion. The magnificently adorned floral stage quickly became occupied by the enthusiastic crowds, who congratulated the performing artists for their masterful performances. KOHAR was founded in 1997 by patron of Armenian culture Harout Khatchadourian of Lebanon, who sustains all the activities of KOHAR and its worldwide concerts, including the recent performances in Lebanon. The ensemble is named in honor of his mother Kohar Khatchadourian and in memory of his father Aram Khatchadourian. KOHAR has not only charmed the audiences during the three-day concerts, but also stylistically positioned itself as the only entity that has revived and promulgated the Armenian culture and alphabet as a renewed oath for the new generations to carry on such a noble aim and cause. The proceeds of the concerts will be distributed to the needy Armenian schools in Lebanon. Pashinyan stressed that today he finally managed to get familiarized with the discussions over SCS head Davit Sanasaryan and came to the conclusion that the “brotherly” mentality has deeper roots in Armenia than oligarchy and criminal. On April 19 children of Mary Izmirlyan children’s house visited Pawsititve dog shelter. Speaking to Aysor.am, pastor of the French Diocese of the Armenian Church Rev. 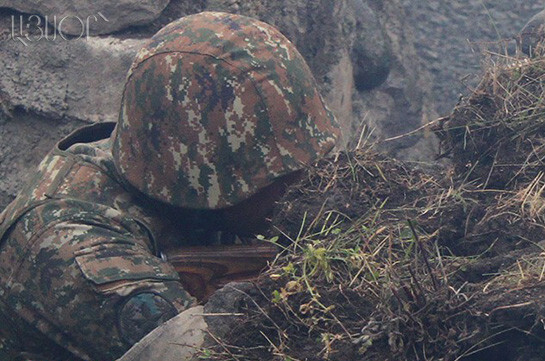 Husik Sarsgsyan said, luckily the suffered losses are restorable and he, as a pastor, tries to be more optimistic and not get infected with presumption of deceit. Considering the circumstance that construction works were held in the cathedral he thinks it is a result of a working mistake. Photo reporter Gagik Shamshyan reports that the citizen has been transported by VAZ 2121 car and currently is being operated on. The doctors are fighting for his life.